Clearly, Gary Speed’s spirit lives on and has embodied itself within Robert Snodgrass – I can’t think of a more feasible explanation for the rapid turnaround in form after some pretty depressing performances had us all worried. 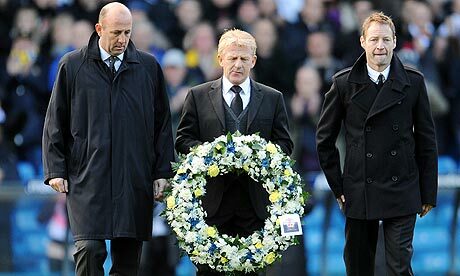 Before the game got under way, David Batty, Gary McAllister and Gordon Strachan returned to Elland Road to lay a wreath for their former team mate – the man who completed the greatest Leeds United midfield line-up this supporter has ever seen. It was an emotional farewell, with Gary’s wife Louise showing a truly incredible amount of strength to attend the game and witness the tributes herself. After the tributes finished, the game got under way, albeit slowly. Millwall set up to contain Leeds and The Whites struggled to break the Londoners down and create anything noteworthy. The biggest story of the first half was Jonny Howson leaving the field injured. Clearly in pain, Jonny sheepishly got to his feet, snubbing the stretcher he looked like he was going to need. Always a worry when you see a player leaving the field injured, but even more so when it’s someone who so rarely gets injured – it immediately leads you to the conclusion that it must be something serious. Hopefully that’s not the case, but I can’t help thinking that the best case scenario is 3-4 weeks without our captain. Lloyd Sam came on as Jonny’s replacement, taking over the right wing so Robert Snodgrass could move to the attacking midfield position Howson’s departure had left vacant. Still struggling to break Millwall down and create opportunities, it was no surprise to see Leeds’ opening goal come from a dead ball – a well struck 25-yard freekick from Robert Snodgrass on 63 minutes. With Millwall now behind, they were forced to try and respond which created the space Leeds United needed to really cause the opposition problems. Just two minutes after the opening goal, and Robert Snodgrass doubled Leeds’ advantage with an excellent diving header from the cross of Lloyd Sam. 2-0, and it really could/should have been more. One particular move saw Luciano Becchio read the riot act by Robert Snodgrass who could have done somersaults in the space he’d made available to himself. Instead of playing Snoddy in however, Becchio stalled and the move came to nothing – an insignificant event in any other game, but you couldn’t help feel that was Snodgrass’ hattrick chance wasted. Still, another three points and The Whites move up to fourth, closing the gap on second placed West Ham United to six, with four points now separating us from 7th placed Blackpool. Almost halfway through the season, and overall, you can’t help but feel satisfied looking at the table. Another clean sheet, two more goals for Robert Snodgrass and the end of our dismal run at home would all seem more important if it wasn’t for the real story today – the Elland Road farewell to a club legend. RIP Gary, Marching On Forever.